Catching the Magalang-bound jeeps early in the morning (5-6 AM) is quite a challenge you know, That's why in my previous traverses on Mt. Arayat, we always end up taking a hired vehicle (van/jeep) from the drop-off points (either SM Pampanga or Dau Bus Terminal) to the jump-off in Brgy. Ayala, Magalang. But last Sunday, we reached the Magalang jump-off purely by commute. hurrah! From Manila, we traveled by bus (4:30 AM trip bound for Olongapo) to San Fernando, fare was P102 and travel time was about 2 hours. It was around 6 AM when we alighted the bus in front of SM Pampanga. There, we were advised by the taho vendor to wait for the first Magalang-bound jeep coming from the bayan of San Fernando as it will arrive anytime soon. The jeep did arrive after 30 minutes or so, fare from SM Pampanga to Magalang was P35, travel time was about 30 minutes. Lastly, at Magalang town, we rode a trike (terminal is located a few blocks from Magalang Municipal Hall) to the jump-off at Brgy. Ayala. Fare was P70 if until the Campo (registration site), P100 if until the end of the concrete road. It wasn't there the last time I did Arayat Trav! Originally, when climbing Mt. 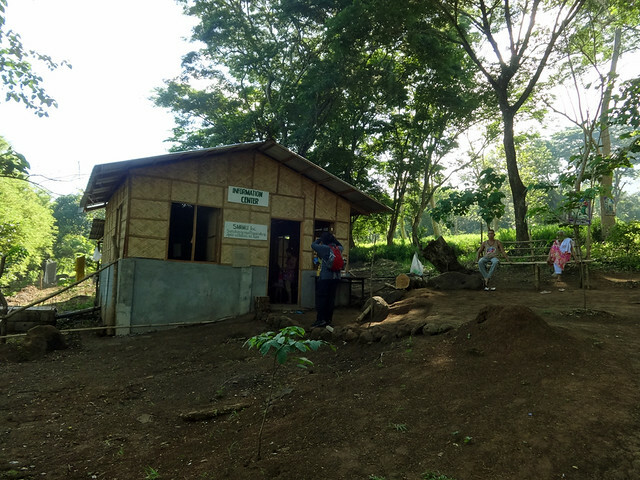 Arayat, you would have to register twice, first at the military camp at the base of the mountain and second at the communication tower at the north peak. No required fees. But last Sunday, surprisingly, there's now a 2nd registration site at the base of Mt. Arayat, located at the trail head of Magalang Trail. 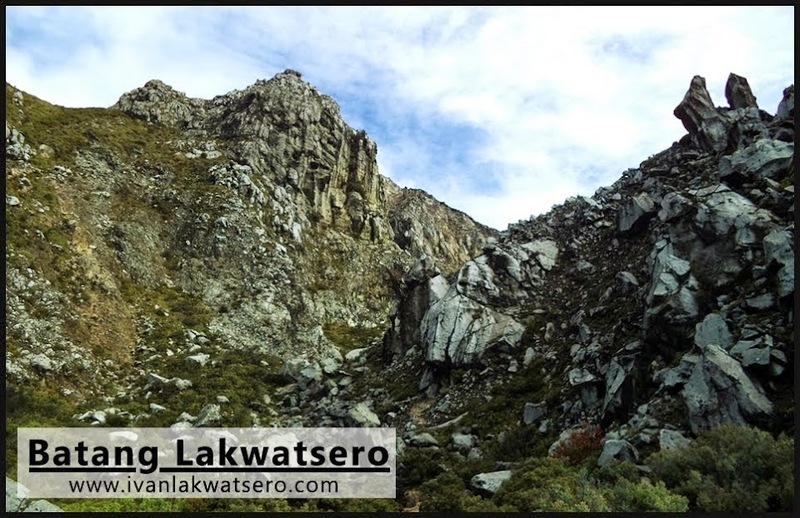 This 2nd registration site was put up by DENR after their recent visit/inspection in Mt. Arayat. Again, no registration fees needed. 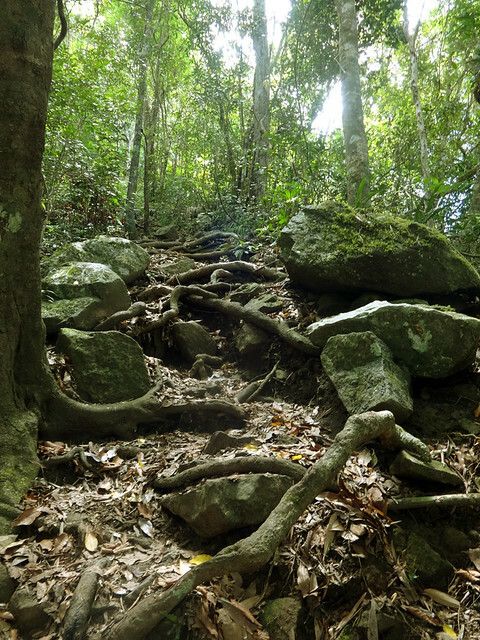 Roots, rocks and boulders — I think these are the words that would best describe the traditional trail. Perhaps, 70% of the whole traditional trail is made up of these. and a combination of the three. Also, by taking the traditional trail, you will pass by the junction to White Rock view deck, a must-see spot in Mt. Arayat. the White Rocks view deck offers a view of the plains of Central Luzon. 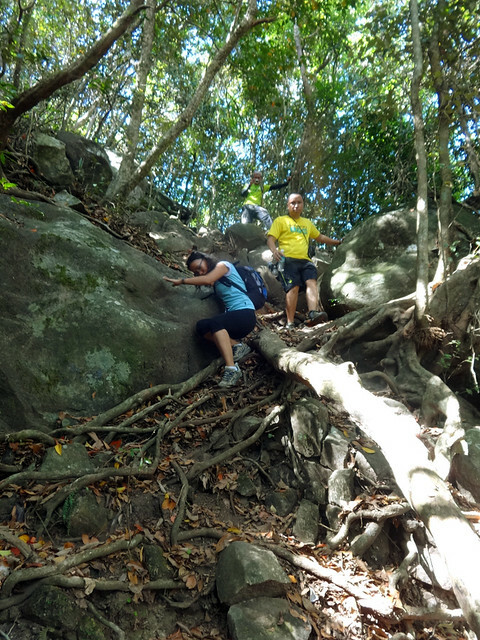 But in this photo, look at the insolence of some of the visitors of Mt Arayat. The New Trail (or Poste Trail), on the other hand, will take you directly to North Peak, bypassing the White Rock, thus a quicker route. It is, however, not as scenic as the traditional trail, quite unremarkable, and purely ascending. The new trail (poste trail). 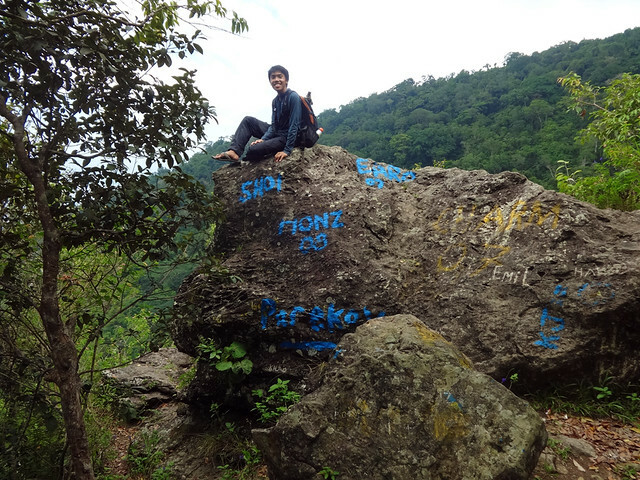 This photo was taken during my third Arayat traverse last November 2012. We accidentally have taken the trail which was, by that time, newly created. 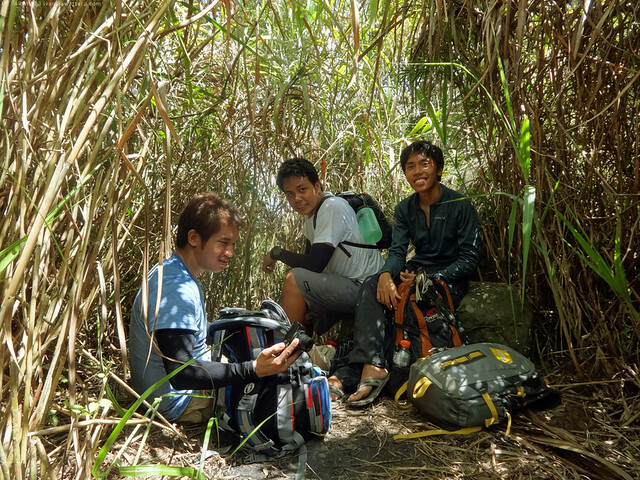 An account of my 3rd Arayat traverse in this link. Where do these two trails diverge and converge? 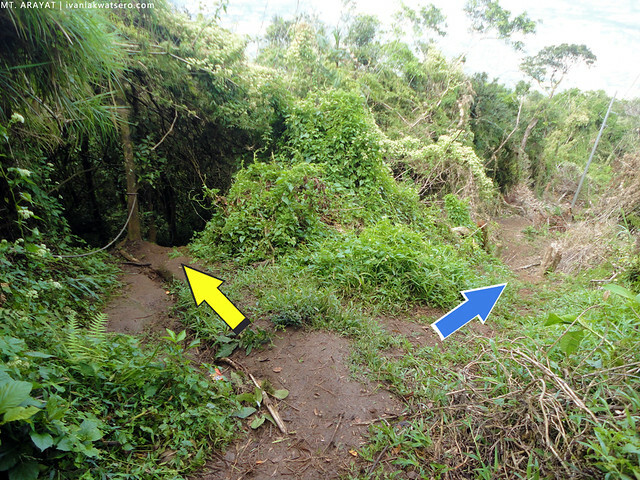 Past the talahiban area, the single trail will diverge into two, to the left is the New Trail and to the right is the Old Trail. 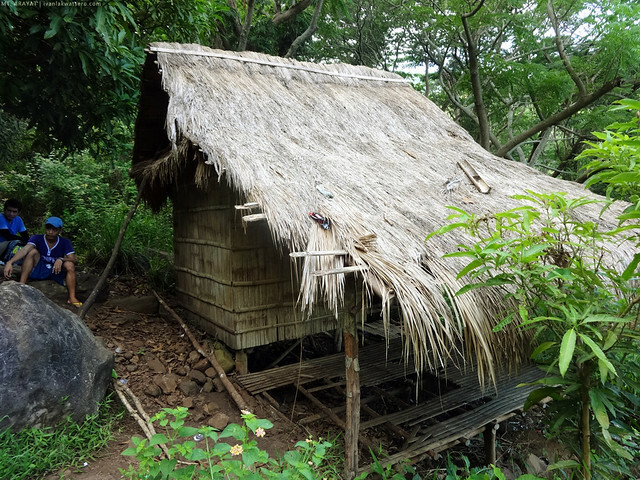 A kubo will serve as your landmark. 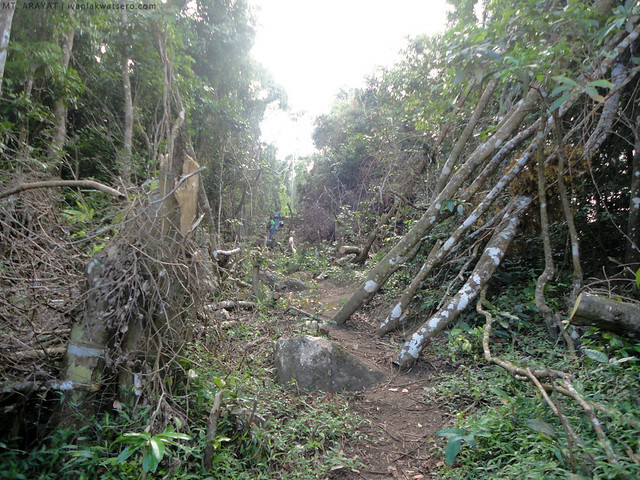 the single trail will diverge into two once you see this kubo. Then somewhere near the North Peak, the two trails will join again. this photo, taken from my hike last Nov 2012, shows where the old and new trails meet again. Another change that I noticed in my 4th Arayat hike is that the military camp at the north peak now has a perimeter fence. Hikers are no longer allowed to get near the communication tower, and are rerouted towards a new trail on the side. 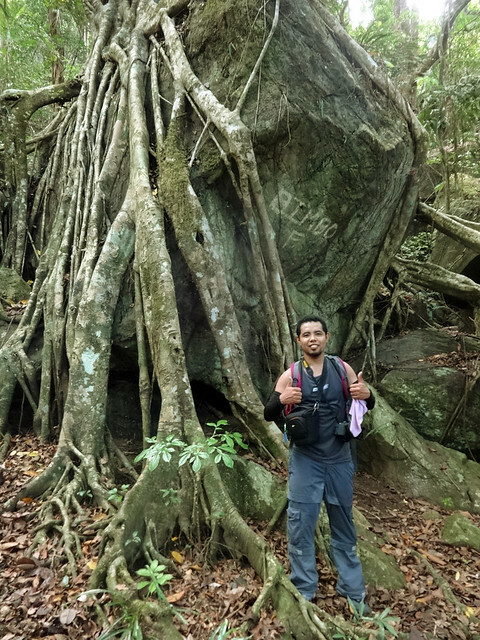 Trekking from North Peak to South Peak is as refreshing as ever. I won't be discussing much in this post, just look at the photos that follow! View from the North Peak. click the photo to enlarge. 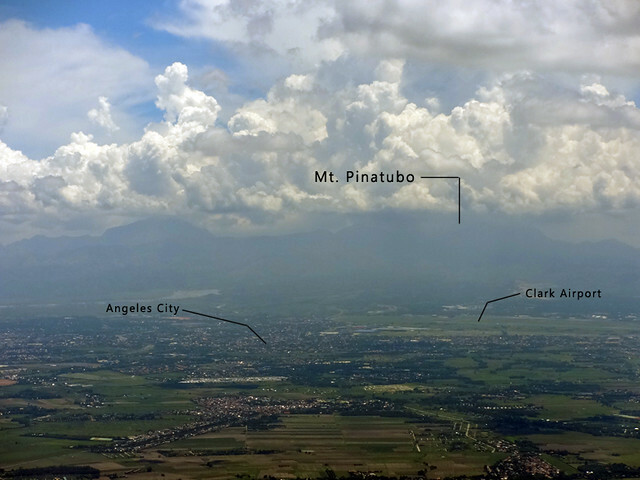 Pampanga and Zambales mountains (Mt. Pinatubo) as viewed from Mt. Arayat's Haring Bato. The 80 degrees boulder challenge, this is my most favorite part in the whole traverse. At the grassy South Peak. 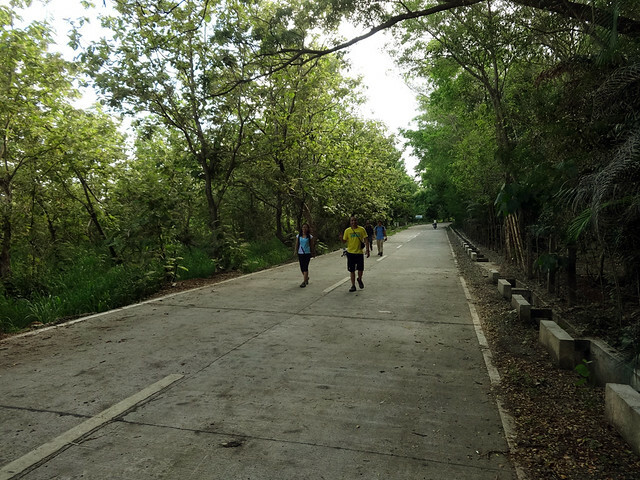 Concrete road again at Brgy. Juan Baño! Finished the traverse after 8 hours. 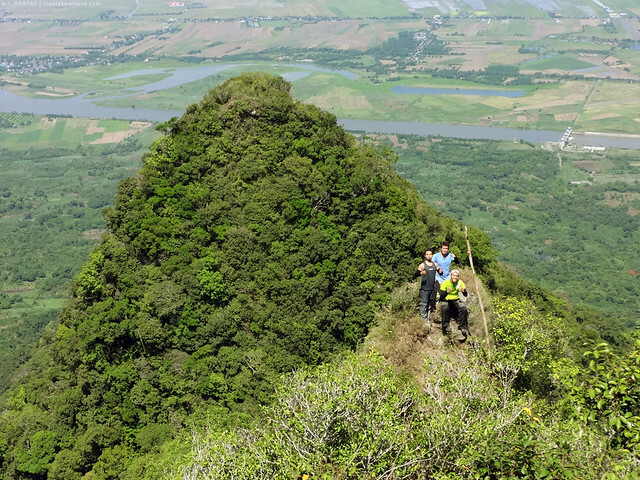 Another hike in Mt Arayat has been completed. Yahoo! Salamat sa mga kasama ko sa hike na ito. Read also my previous hikes in Mt. Arayat. Check them out! Salamat Idol! Well said! Tunay ngang napakaganda ni Arayat! Babalik balikan talaga! Meron sir, hindi lang sila nagpapahalata. Mababait naman sila so no worries. another mountain for me... so near yet so far.. haven't been here. yun po bang fence na ginawa ng military camp sakop pa din yung campsite? safe po ba pumanik ng arayat overnight? 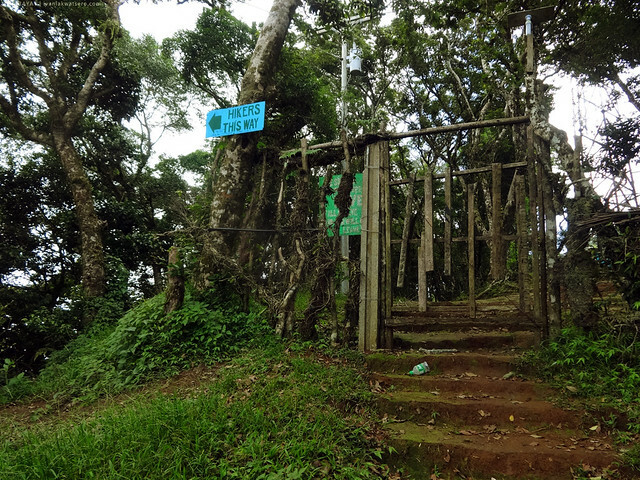 hndi, pinalawak lang nila yung fence nila sa harap, pero yung campsite sa likod as is :) Kung camping ang gusto niyo, I prefer the south peak campsite kesa sa north peak (military camp). I think it's safe naman dito. There's a resort in Brgy. Juan Baño. Pwede kayo doon maligo. 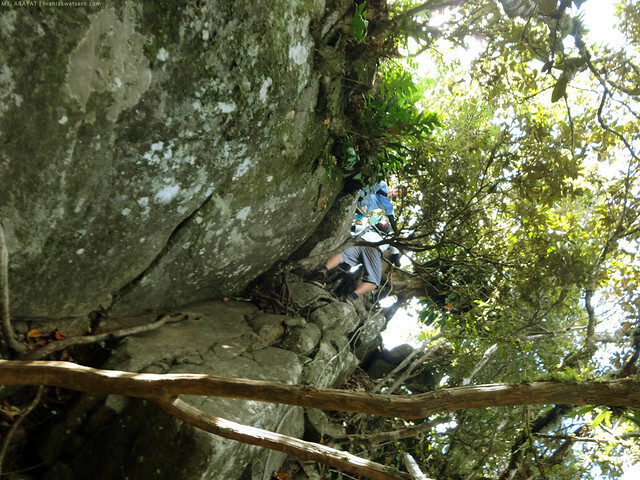 gusto namin ng gf ko sumama sa mga climb mo. mejo matagal na kami natengga from hiking. possible ba sir na makasama sa mga panik mo? ways to contact you? Baka po may alam kayo na contact number ng guides dun?? My group is planning to take the traverse at the end of this month..? Arayat is a first class municipality in the province of Pampanga, Philippines. 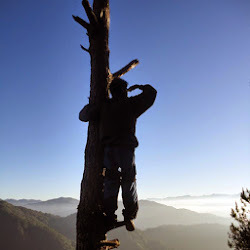 I think this is perfect place for hiking trip and you can also enjoy camping in few destination. 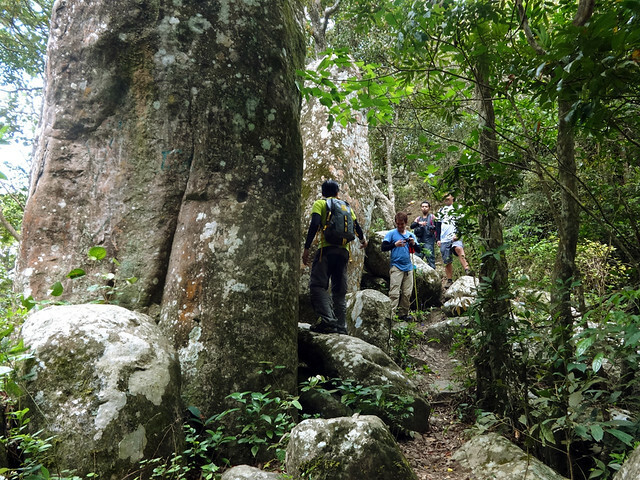 These traditional trail are really enjoyable as hiking track. Hi Do you have guides for this? Hi mga Sir/Ma'am kakaakyat lang po namin ng Mt. 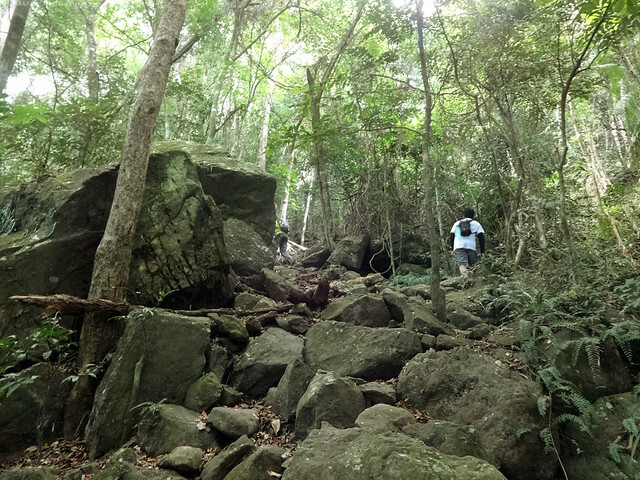 Arayat Traverse, last May 10,2014.. If may kailangan po ng Guide..
Si Sir Like po yan..
And nagooffer din po sya ng Transportation from SM Pampanga to Drop-off..
Hi sir/Ma'am.. Kaaakyat lang po namin ng Mt. Arayat Traverse. If may nangangailangan po sa inyo ng Guide ito po. Like po ang name nya. 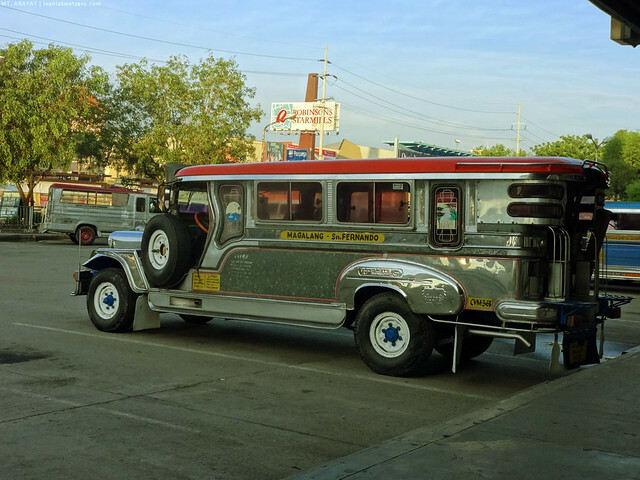 Nagoofer din po sya ng Transpo from SM Pampanga to Drop-off. anu mas maganda day height lang bah?..., ilang oras from drop-off to peak? May Lematic po ba sa Mt. Arayat?